One day late last year, Jordan and I headed down to Palo Alto, CA where we had the great pleasure of playing with some of their top players one of whom is Brandon Loong. Brandon is great player. He is tall, with a massive wingspan and a dominating presence on the court. I had the privilege of partnering with Brandon for a few games. Of course, as the woman (me) partnering with a great male player, guess who receives most of the balls and gets attacked on our end? The same thing happens when I play with Jordan. It makes perfect sense, I would do the same thing if I were on the other team. Luckily for our team, this doesn’t phase me. I expect it. It’s tough and a lot of work but I can handle it. I can defend it well for the most part and more often than not we end up on the winning end. I owe my reflexes to lots of drilling I did as a tennis player. Fast hands do not come quick and easy. Like any skill, they need to be developed and built over time. There are many drills that you can do to work your fast hands both by yourself and with a partner. 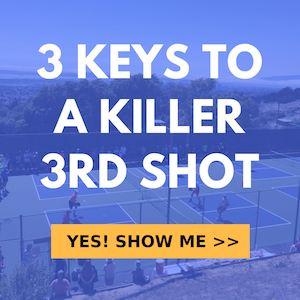 Many of these drills have long been used in tennis and and translate easily to pickleball. Recently, we partnered with Tyler Loong, who is also a top player and happens to be Brandon’s brother, and with Tyler’s help we show you 3 great drills that help develop FAST hands.